I have just had a beautiful fireplace fitted by Ward Antiques. I can not recommend them highly enough. The service is brilliant and the excellent work speaks for itself. I am delighted. Very happy with our new fireplace. Wards very professional and friendly service from start to finish. They came out after hours to measure up as I get home late from work and fitted the fireplace next day. Happy to recommend. We’re very happy with the work carried out by Ted and the team at Wards. They took our original but knackered fireplace and restored it top to bottom and re connected it.The fireplace is looking fantastic now, and we’re delighted with the result. Very friendly, professional and knowledgable staff – couldn’t recommend them more. Thank you! I really cannot fault ward antiques for their incredible service. They fully refurbished the two fireplaces in the image and sandblasted two larger fireplaces and made new bars, ashpan and cast iron fireback for us as well. They kept us in the loop and Ted was very accommodating and patient to any changes I requested(& there was more than one!). I work with antique dealers and restorers and this is the kind of service you hope for, we are delighted with our 4 refurbished fireplaces. Will definitely be using them again soon. Mick and Stuart did an excellent job with our fireplace installation. Cleaned it up beautifully and were very punctual and professional with the install. Very happy customers! We are so pleased with our restored fireplaces. They had been badly damaged by a subsidence problem from our neighbours. A professional service from start to finish and fast. Beautiful workmanship, you would never know the marble surrounds had been damaged. I would highly recommend this family firm. Very pleased with the work carried out by Wards. They made a bespoke gas fire to fit an existing fireplace. Ted was extremely helpful throughout and sourced replacement bars which were missing from the grate. The job from start to finish was trouble-free. A very nice firm to deal with. We are really pleased with our two new fireplaces supplied & fitted by Ward Antiques. Ted, Mick and team could not have been anymore helpful. The service from start to finish was exceptional. Nothing was too much trouble. The fireplaces look fantastic. It was great to see a company that are passionate about their products. Would highly recommend this family business to anyone looking for a wide variety of fireplaces and tiles to choose from. Can’t praise them highly enough. Ted and his team did a brilliant job of restoring my 1890’s bedroom fireplace. The tiles in the fireplace had been painted black by the previous owner and I had no idea that such an impressive piece lay beneath it all. I changed my mind a couple of times about the finish – as you do – but this was no problem for Wards. Alfie did an exceptional job of spot polishing the piece – thank you again. I have already recommended them to a friend who is thinking of getting hers done after seeing mine. Reliable, trustworthy, exceptional craftsmanship and I’ll be using them again for the fireplace in the living room. Ted and his team were fantastic at sourcing a replacement hood and grate for our Edwardian fireplace. The originals had long ago been removed, and as the fireplace is a rare unit, we had struggled to find replacements until now. The fitter did a brilliant job, and turned an eyesore into a proper feature in the entrance hall. We had our twin Victorian fire places restored to original condition and returned to open fires with a slate hearth. We received an excellent, quick, clean and friendly service and an A Grade finished product. All for a fair price. Highly recommend Ted and his team. We couldn’t be happier. Delighted with the service from Wards in sourcing a lovely new marble hearth for our fireplace. Their fireplace fitter did an excellent job and he also cleaned up and painted the fireplace. They also helped us in the first instance with helpful advice and with recommendation of a Chimney Sweep. Many thanks. We would highly recommend – They are knowledgeable, trustworthy and they, and those they recommended were a pleasure to deal with. We can’t reccomend Ward’s and especially Ted highly enough. We had been to a couple of other “specialists” but thought it worth shopping around a bit, so contacted Ted. He opened up especially for us on a Sunday and gave us good sound advice all the way from choosing the right fireplace for us to whether or not to have it spot polished etc. The installation was just as professional resulting in a great fireplace that we are really happy with. Really pleased with the restoration of my ash pan. Wards did a great job, I can’t recommend them highly enough. It looks ace and am please to be able to retain the original 1930s kit. We got an absolutely fantastic fireplace from Ward Antiques – we are really pleased. They helped us choose it and get it installed and also put us in touch with excellent contacts for chimney sweeping and flue lining. Top class service. (and it looks brilliant). Wards have just done a great job on restoring my 1930’s ash pan for my fire grate. It’s transformed the fire place and I’m thrilled with the outcome. The staff were a pleasure to deal with . Also, these guys are the real experts on fire places. I have no hesitation on recommending this firm. Great job transforming our empty hole in the wall into a well matched antique insert in a lovely surround with a beautiful slate hearth. Great advice and guidance from Ted throughout and a real sense that everyone cares about doing a great job from choosing to restoring to fitting. Genuinely nice people to deal with into the bargain. Worth speaking to them if you can’t immediately see what you need on the website. For example, we couldn’t see a matching surround for the antique insert we wanted, but they were able to commission a bespoke reproduction which matches others in the house, along with tiles which match our decor and other period features in the house. The fitter also did an excellent job and was very focused on making it look just right. We are so pleased with the finished article and wouldn’t hesitate in recommending Ward’s. Wards Fireplace did an absolutely amazing job of installing my fireplace. The service was very friendly and professional – I’d highly recommend! These guys are not only lovely people but they are fireplace gurus !! A really wonderful fireplace from Wards has made our living room worth sitting in! Mick and their fitter did a really excellent job, including advising us on how best to get what we wanted within our budget. Very satisfied customers! I am absolutely delighted with the amazing job Ted and his team did refurbishing my fireplace. Nothing was too much trouble and the team were informative, incredibly knowledgeable and a pleasure to deal with. As Ted said when I initially called for a quote “we do a proper refurb job and and I don’t like half hearted work” he was true to his word and I’m delighted with the result. I was also like to mention Stuart who did a fantastic job of fitting the hearth and fireplace. Nothing was too much trouble. He had to overcome a few issues which he did with zero fuss and was so helpful. Thank you Ward Fireplaces. Our Edwardian fireplace was in a very sorry state when we purchased our property and Ted and his team were so helpful in its restoration. We were completely missing the central part of the fire, but Wards were able to recast these from the original pattern that they had on file. They also did an excellent job of removing the old paint, reblacking it with some very attractive highlighting of the detailing on the fireplace. It looks absolutely fantastic, is a real centrepiece from the room and I’m sure looks better than when it was first installed in 1915! Our second testimonial to Ted and the Wards team. After a fantastic restoration of our downstairs fireplaces they were first choice to supply fire for back bedroom. Once again Ted has left us very satisfied customers and once again the difference has been passion for delivering a great job and going the extra mile to do it. The perfect example was Wards taking the time to separately source a pattern and cast a grate to replace this missing part for another fire. Now complete, it looks excellent. Even with such a small jobs there is no compromise on service or quality. So, again many thanks to team. A special mention to Alfie who dropped off the fire and fitted the new grate, mother in law very taken by such a nice polite young man! Just had the hearth re-tiled, the fireplace fully restored and the marble surround polished up – it all looks so much better and is now a lovely feature of the room. Ted organised everything to happen quickly and efficiently, and also gave us info about the history and design of the fireplace. Nice to find a company that takes lots of pride in what it does! Ted and the team did a brilliant job of restoring our cast iron combination fireplace. The fireplace had several layers of black paint added over the years, and had really lost some of the detailing in the process. They gave some excellent advice detailing the types of finish we could select, even sending some photographs of identical fireplaces they had restored which showed us the type of finish we could expect. In the end, we decided to have the old black paint stripped, and the fireplace polished in a highlight detail which really picked out some of the ornate details beautifully. Ted came to North London in the van to pick up our fireplace on the Wednesday afternoon, and returned the fireplace to us on Saturday morning at 8am prompt just like he said he would. They even provided a neat black marble decorative hearth for our fireplace to sit on at short notice. Finally, they gave some great advice on how to keep our fireplace looking clean and rust free! Wards have some of the best customer service we have ever experienced, and we are really delighted with our restored fireplace! Delighted with the service and support from Ward Antique Fireplaces re the full refurbishment of two fireplaces – including new hearths. Took one of the more awkward aspects of my refurbishment project and made it easy. One old marble fireplace was in such a bad state, I was going to discard it – now renovated, it’s one of the most attractive features of the property. Ted and his colleagues clearly know exactly what they’re doing, flagged up any issues in advance, and ended up giving me a result that far exceeded my expectations. Highly recommended. I needed a replacement set of fire bars as these were missing from my fireplace. Ward were able to identify the correct original design and cast a new set from a pattern they held. A great and helpful service! We are delighted with the restoration work Ward undertook on two fireplaces in the attic bedrooms of our home in Guildford. The work was undertaken swiftly and efficiently, and the fireplaces have been transformed. Ward showed impeccable attention to detail, in particular with tricky hearth fittings. The work was undertaken with no extra charge for the journey to Surrey. I highly recommend Ward to anyone looking for a clean, reliable, swift and expert fireplace restoration service in the Home Counties. I can’t recommend Ward Antique Fireplaces enough. We asked them to restore our Fireplace which was covered in paint and poorly maintained. They needed remove the gas as we wanted to return to real fire. Ted and the rest of the team were helpful, knowledgable and very reasonably priced. I was very confident that we had chosen the right people to do this for us. From start to finish Ted explained everything that they would be doing to restore our Fireplace, including what we needed to do to make safe. Stuart the fitter was great and did an excellent job. We had great advice to pass on to the decorator as well as how to maintain the fireplace. We are really pleased with the end result which only took a few weeks. We’ll be asking them back to do the next fireplace. Ted has just delivered our two Victorian bedroom fireplaces; stripped, powder coated, with 2 new sets of replacement bars and a damper plate (and two slip hearths). The fireplaces are lovely and I think are good value. But the customer service has been excellent. Nothing has been too much trouble and Ted has communicated and kept in touch via email and on the phone throughout. Old fashioned excellent customer service which stands out all the more because it is increasing rare to get this level of attention. Despite living in Southampton we will be going back to replace a downstairs fireplace stripped out by a previous owner. Had a great service from Wards, despite me taking about a year to decide what I wanted, they were patient and obliging. Stuart the fitter was efficient and friendly too. Very happy with the results. From the first moment we walked into Wards in Hither Green we were welcomed and we knew we were in the right place to get our unloved Victorian fireplaces back to their best. Excellent service from Ted and the team that included some great welding repairs and sourcing of missing parts – nothing was too much trouble and we received plenty of advice and recommendations to make what we felt was the best choice for each fireplace. The hearth restoration, installation and tiling from Stuart and Steve went very smoothly – we knew what was expected to happen on each day and what order so nothing was a surprise. The work completed was done to a high standard with care and consideration – as a result we have been given back 4 beautiful and functional room features. If you are thinking about rennovating your fireplace I cannot recommend Ward Fireplaces highly enough. They were absolutely brilliant from start to finish. (very reasonable by the way). As Mick said ” Why does eveything have to be so complicated?” Sadly, some other Tradesmen make it this way to line their own pockets. Stuart (the fitter) called me a few weeks before the fitting to check that there were no obvious hidden surprises and, on the fitting day, texted me when he was on his way. When Stuart arrived and knocked out the hole for the insert he realised the lintel was missing – he simply popped out and picked up a new one (as he didn’t have one in the van). I’m sure other fitters would have rubbed their hands and added it on to the bill. Stuart was really thorough and you can tell he takes pride in his work. A job well done. Within 2 months of first speaking to Mick we now have a fully working period fireplace with tiled hearth – all in time for Christmas! (Thankfully the kids haven’t realised that they can toast marshmallows on it yet). We are really pleased to have chosen Ward Fireplaces (recommended by the chimney sweep) and really do value their approach and professionalism. I only wish I had more fireplaces to restore! I’d like to extend my deepest thanks to Ward Fireplaces for recently completing the renovation of three fireplaces for me. Thank you Ted, Mick and George, the brilliant fitters Stuart and Steve, the behind the scenes workshop crew, and not forgetting Indy the dog! Ward took on the restoration of three fireplaces for me (all in different states), but what really stands out is Ted being able to find the original parts for the missing centre of my living room Britannia fireplace, which was superbly restored to its former glory. Throughout the restoration process Ted sent me photos of the ongoing work, answered all my queries and allayed my concerns, and I jumped at the chance to see the workshop when Mick offered to show me! In terms of the fitting itself, Stuart and Steve showed superb skill and professionalism with their work installing the fireplaces and hearths, and also in their ability to deal with me, as I am very detailed orientated (some would say OCD). As a result of their precise work I am very, very satisfied with the outcome, and I am as fussy as they come. I now have three absolutely beautiful, fully working, period correct fireplaces in my flat, along with the tiled hearths to match. I couldn’t be happier. Thank you again to Ward Fireplaces for making this a reality. Absolutely exceptional service from Ted & co. We had the front only of a small bedroom fireplace and it was painted black gloss. I sent the rd. no. to Ted and he collected it from our door. A week later he had fitted an original integrated back (including firebrick), sand-blasted and oiled, made an ash cover in the original style, and returned the whole ensemble to us. Great price and service, full of insight & handy tips too. Look nowhere else for fireplace needs. Needed to replace some missing parts on one of our fireplaces. Ted was extremely helpful. Fantastic communication on the phone and email prior to visiting. Finish was excellent, and attention to detail was second to none. Everything was completed within the original timescales. Would happily recommend Ted and the team for any fireplace needs! This is our second fireplace from Ward’s, the service was exceptional as always from recommended sweep, through to purchase and fitting. All correspondence was timely, honest and felt truly personal. Price was reasonable, all costs were accurate and our room was left in excellent condition. We visited Wards and George was very keen to help us find the fireplace that suited our needs and budget. He was very communicative via email and in person and was happy to answer a multitude of questions and queries. He was very honest in his approach. The service thereafter was excellent. The fireplace installation was fuss free and the finish looks excellent. Can’t recommend Wards enough for the quality of their products and customer care throughout the experience. Just had my second fireplace delivered this morning and it’s absolutely beautiful….I had asked for one for my lounge that would suit the age and style of the house and they said that there was one in the warehouse. George sent photos and dimensions through and within a few minutes, we had struck a deal……thanks to George, and to Ted for delivering. Would definitely recommend Ward Antique Fireplaces to anyone who is looking for a quality fire surround, with the added benefit of an experienced family team at the heart of the business. The thing that I most like about Ward Antiques is working with a family firm who have an amazing knowledge and passion for fireplaces. The renovation of my five existing fireplaces resulted in a complete transformation. Each was sandblasted, repaired, polished and refitted to an excellent standard. When I asked for their expertise with two more fireplaces they sprang into action finding an exact match of the existing surround and two identical inserts. They look spectacular! Communication and customer support was impeccable; everything from dating my fireplaces to organising the installation was done efficiently and to the agreed timescale. I was even lucky enough to visit the Ward workshop and see my fireplaces during their renovation. Alfie highlight polished all seven and they look stunning, a great job. I also need to give a special mention to Ted who really has gone the extra mile, thank you. I would recommend Ward Antiques to anyone who wants to restore existing fireplaces or add new and sympathetic fireplaces to their home – you will be looked after from the first enquiry to the final fitting. Ted was absolutely fantastic and really helped me out on a restoration of a Georgian fireplace in a very sorry condition. His customer service was impeccable, he pulled out all the stops to deliver and even delivered and installed early! Thank you so much Ward Antique Fireplaces, beautiful job! I’m having a Victorian fireplace cleaned and restored by Ted from the Beckenham branch of Ward Antique Fireplaces. Ted, and his very helpful son, have visited twice so far, to inspect and measure for the appropriate parts and then to repair part of the chimney. Good punctuality and reliable service. Have recently had a decorative restored Victorianfire place in stalled in my bedroom. The fireplace was bought on eBay and Ted and his team did a beautiful job restoring it. Extremely helpful and very nice to deal with. Have recently bought 4 art nouveau fireplaces and tiles from Wards and have had 2 fitted so far. I am absolutely delighted with the whole process – Mick was really helpful in the Hither Green shop and Ted did a site visit and arranged all other aspects of the fitting/delivery/chimney sweeping. Together with the fitters, they provide a really excellent service and I couldn’t be happier with everything so far. I am looking forward to having the other 2 fireplaces fitted very soon! We saw the shop when driving past and decided to stop in. The selection is incredible and the staff (George) very helpful. We got a Victorian fireplace and Ward Antique build us a wooden surround to match it. Delivery was on time and all as expected. The fireplace is spectacular and we love it. Would whole heartedly recommend. Recommended to me by a friend and they did not disappoint. They laid out all the options and totally transformed two fireplaces that had been sadly neglected but now look stunning. Thank you so much to Ted and team at Ward Antique’s – cracking fire installed last year and then came out to sort a grate slip (and teach me how my fireplace works) free of charge today! Wonderful service and educational to boot, highly recommend them to all. Thank you. We’ve just used Wards again after having been very pleased a few years ago, and we weren’t disappointed. Great advice, a beautiful restoration job, and all expertly fitted. Many thanks. 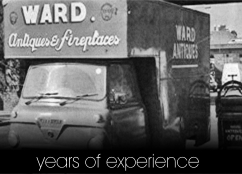 Brilliant job from Ted and the team at Ward Antique Fireplaces! Our builders decided to leave our much loved antique fireplace in the garden to rust. Disaster! Ted and the team came to the rescue incredibly quickly and picked it up next day. They sandblasted, polished and found replacement parts to make our fireplace look even more stunning than it looked before. I would recommend Ward Antiques without any hesitation whatsoever. Thanks again. Ted and Mick Ward have a fantastic selection of surrounds and inserts, but most importantly, tons of experience too. We have been very happy with our selection of vintage, restored and new pieces for our house along with the excellent services of Stuart the fitter. Wouldn’t hesitate to recommend them. Excellent service from Ward of Hither Green. First class quality from choosing the right fire surround to installation.The installers were very professional and friendly and left the room clean and tidy. I would highly recommend Ward Antiques. Great service from George, understood exactly what we wanted and brilliant hassle free fitting on the day- all costs upfront and straightforward. Would happily recommend. I just bought two reconditioned Victorian marble fireplaces with cast iron inners from Wards and they look absolutely beautiful. George helped me choose the fireplaces and showed me their workshop around the corner where the guys were restoring the old fireplaces. They were very friendly and helpful. The process was so easy because they also arrange for their fitter to pick up the fireplaces and fit them. I thoroghly recommend Wards. Bought a superb Art Nouveau insert and tiles from Wards recently. Service was friendly and helpful throughout. George and team delivered the piece at a convenient time and fitted the tiles just as I requested. Great service, thanks very much! For over 10 years our original front room fire was unusable due to missing front bars and ashpan / a span cover. Looked everywhere here in the Midlands for something that would fit but failed, being told it was an odd size and probably a mashup of several fires. I didn’t want to replace the whole thing so felt it would have to be left. Then found wards online. Sent them a not fantastic photo plus dimensions, and the knew exactly the model (not a mashup at all), they had a pattern, and could cast us the missing parts! They sent those by post and we found they fitted perfectly. You can’t tell the old from the new! I only wish they were closer – we’d have had the whole thing done up at the same time as the surround is definitely a bit “tired”. But for the last 2 winters, we’ve had lovely real fires, thanks to wards. Brilliant service from George – he really knows his stuff and I couldn’t recommend him highly enough. We love our fireplace – thank you! Ted was a great help when it came to choosing a fireplace and hearth. They delivered at a time that was convenient for me, and turned up on time. Would definitely use them again, and recommend. Got in contact with Ted as needed a restoration of an original cast iron fireplace. Picked it up today…looks stunning! Very helpfull and well priced. Would def recommened for your fireplace needs in SE London and beyond!! I haven’t used this company due to my incompetence in fitting a fireplace myself!! But, mick, couldn’t of been more helpful explaining what I should and have to do it.. would well recommend anyone! He gave a lot of advice to me knowing he wasn’t getting a sale or money from me! Diamond geezer! Cheers mick!! I was looking for a nice antique fireplace to replace an unattractive MDF fire surround. Ward provided a great service from start to finish, which included advice on the style of fireplace, tiles and choosing the best fireplace size for my hearth. I’m really pleased I chose Ward and I’m very happy with my new fireplace. I chose two fireplaces at the shop and they were installed a week later. Installation took a day and the guys tidied up after themselves. It was all very painless and low stress. The shop people were very knowledgeable and experienced . I could ask their opinion about things. Everyone is very friendly. I’ve done up the whole house and this is probably the easiest bit. They are a really great team and 100% easier to deal with than some of the other companies I approached. This is definitely the place to go. George was so helpful, knowledgeable and cheerful as I tried to choose which fireplace and surround. It was all supplied on the agreed day and beautifully fitted by Stu – really lovely job all round. Ted popped in too on the day. In fact the sweep, fitter and the guys in the shop all worked together brilliantly. Thanks very much. I am very happy with the set of art nouveau fireplace tiles which I have just bought from Ward’s. Mick and George were most helpful and efficient. Many thanks for all your help! I had two Victorian fireplaces installed. Great advice, good service and fair prices. In particular the replacement mantle for one of the fireplaces was a fantastic copy with good attention to detail. I love both of them! Not forgetting Stuart, installation spot on despite a few challenges. Many thanks. Lovely fireplace. Great service and advice from shop. Fitting was so well finished and all left clean. At the risk of repeating what everyone has said on here, we thought it was really great service and we are exceptionally happy with our fireplace. I have recently had the Ward Bros & Co install a magnificent fireplace in my living room It takes pride of place and I am so very pleased with it. The workmanship of “The Firm” has been first class, from my first meeting with Mick and his invaluable advice, meeting Ted and his expertise, and speaking to George who very kindly arranged for the chimney sweeps to come at short notice.Stuart and Steven the fitters were first class. Clean and tidy workers and very polite and appreciative of the cups of tea provided. In all I am very impressed with the whole Company and would have no problem in recommending them to anyone who asked. . Wards did a fantastic and professional job fitting two fireplaces. It was great to have a reliable team on the job and the finish was first class. Excellent service from start to finish. We had our insert restored which looks amazing. Had new surround and hearth fitted. Couldn’t be happier. George and Ted very helpful and great to work with. Stuart did an excellent job and everyone took extra care to protect flooring. Cannot fault it. Very happy. Thanks guys. We are absolutely thrilled with our fully restored pair of fireplaces. We wouldn’t have believed that crumbling marble surrounds, leaning and rusty insert, broken grate and fire brick could be made to look good as new. I wouldn’t hesitate to recommend Wards the service and expertise was fantastic and the renovated fireplaces completely transform the room. Top job! We love the new fireplace and it looks like it has always been there. It was such a pleasure doing business with a company that really cares about their product and customer service. Stewart the fitter did such a brilliant job and the fireplace looks stunning. I love my fireplace !! What a helpful and efficient company ran by people who are keen to assist and offer their advice especially George at the Beckenham branch and fitter Stewart. I couldn’t be more pleased. Thank you. An absolute treasure trove of beautiful antique fireplaces, lovingly restored by a team that are knowledgeable and passionate about their business. Could not be happier with our new fireplace from Wards. Our house finally feels like a home! We searched everywhere (including the whole internet!) but nothing compared to the Coalbrookdale we found in Wards. The team are so friendly and really know their stuff. After talking with Ted we opted for a tiled hearth, which was expertly fitted by Stuart, and looks the perfect match. If you’re looking for a fireplace make Wards your first stop, as you won’t find better anywhere else. Absolutely delighted with my fireplaces. Ted and Mick pulled out all the stops for me, and helped me source just the right tiles. Stuart adjusted his schedule to fit the fireplaces with my carpenter. I cannot praise Ward high enough. This is the second time we have relied on Wards to work some of their magic. Great experiences both times. Mick and Ted really go the extra mile and their team just get the job done on time, on specification and with the minimum of fuss. Thanks. Very happy. Ted, Mick and their team were excellent from start to finish. They talked us through our options and then helped us source a beautiful surround and refurbished our original insert and tiles. Having had two fireplaces restored and re-fitted by Wards I was extremely impressed with the service, professionalism, knowledge and passion of Mick and the whole team. I have recently had to call upon Wards for unexpected “aftercare” services after a decorating incident damaged one of the restored fireplaces, Mick was fantastic and on hand with helpful advice and a demonstration of how to restore the fireplace back to its former glory, which was greatly appreciated. Highly recommend and many thanks once again Mick for all of your help. We have had four fireplaces restored and refitted and we’re really pleased with the results. The fireplaces look amazing – far better than I ever expected – at the fitting process has been stress free (and most importantly clean!). The level of customer service we have experience throughout has been second to none. I would definitely use Ward Antique Fireplaces again! I have bought 2 original Victorian fireplaces from Wards Antiques, which were restored to the highest standard and look amazing in my home. I originally bought a small bedroom fireplace but Mick was able to source a matching larger one for my living room which was amazing. Mick, Ted and the team were extremely friendly and knowledgeable about the business. It was a pleasure to meet them. They have a large, beautiful and varied range of fireplaces to choose from. Highly recommended. Ted and his team at Wards have restored three fireplaces for us so far – they are absolutely beautiful and they are the highlight of our home. The team were professional and polite throughout, from start to finish. They came and removed the fireplaces and had them put back with little fuss. Cannot come more highly recommended – thanks once again to you all!! We met all of the guys in both the Hither Green and the Beckenham stores and found them to be very helpful, knowledgeable and friendly. Wards pulled out all the stops to get the fireplace fitted very quickly for us. The chimney sweep and fitters were professional and friendly as well. The fireplace looks stunning. We’ve had several fires now and are extremely pleased. Merry Christmas guys and Happy 2015. I cannot recommend Ward Antique Fireplaces highly enough. Very helpful, friendly and knowledgeable team and my fireplace is the highlight of my home thanks to Wards. I have two more rooms to fit with fireplaces and I will definitely be using Wards for these. I would just like to say a big thank you to George, I popped into the Beckenham branch on the spur of the moment just before Christmas and am now the proud owner of a gorgeous new fireplace! All the team were super friendly and very professional. They even managed to squeeze me in and fit my fireplace in time for Christmas! I would highly recommend them. What a great company! I would like to thank Mick for his great advice and wisdom in sorting out my period fireplace and his knowledge of the subject is amazing! Highly recommend. Ted and his team are amazing, very helpful and knowledgeable. My “tidy Betty” fire front was broken and they fixed it immediately. I’m extremely happy and thankful! I highly recommend this company!! I recently removed a 60s wardrobe in our bedroom to discover the original Victorian fireplace but it was missing some parts not least the mantel shelf. George was particularly helpful in sourcing an original shelf to fit the fireplace and then able to get the other parts newly cast for me. So we now have a fine looking original fireplace with nothing missing. I was impressed with George and the others at Hither Green by their knowledge of the subject and their efforts to find the pieces needed. There was no attempt to dissuade me from finding what I needed nor any attempt to sell me a new fireplace. Overall I would recommend Wards to anybody looking for replacement parts as they really know their stuff. Thank you George. What a fantastic team!! My Victorian fireplace was missing its bars and ashpan and I wanted it restored to its former glory… Ted found a larger, complete one, bought it, scaled down the missing parts and recast them to fit my fireplace – unbelievable dedication!! Mick then sandblasted my rusty original, polished it to within an inch of its life, and then highlighted the details beautifully. He did the same for the cast iron fireside dog ornament which now looks a treat. All the staff are so knowledgeable and helpful. What’s not to like?!!!! What a great Company! I am just about to start a major house renovation and called to see if Mick was interested in the existing Victorian fireplaces – unfortunately the’y’re damaged and are therefore not suitable for Ward Antiques. Mick then went on to give me so much excellent and honest advice which has saved me a lot of money. I am a single woman and felt that someone wasn’t just trying to take my money… Thank you so much for all your help – it is much appreciated. So impressed with what Ward Antique Fireplaces did with our cast iron fireplace. When we bought it it was covered in paint and very rusty, and didn’t hold out much hope for it. But wow, we picked it up yesterday (after a very quick turnaround) and it looks incredible, like a brand new fireplace! We can’t wait to get it fitted in our bedroom now. Highly recommend these guys – great service and quality of work. Amazing fireplaces to suit every budget! Really professional friendly team with expert knowledge. Thanks Ward antiques! We recently visited the Hither Green shop looking for a Victorian fireplace for a house that we are renovating.The Choice was amazing and the prices very competitive.In addition to this the guys in the shop were really help and well informed ,so we bought a beautiful cast iron fireplace which then then delivered all the way to Norfolk and recommend a brilliant fitter who put the fireplace in for us. We would recommend this shop and the team to anyone We will be back when we renovate the other rooms. If you want the best look no further. Excellent service from start to finish of all those involved. We were not quite sure what we wanted but after a visit to the Beckenham and Hither Green showroom we had found exactly what we were looking for. Friendly, honest, reliable, totally professional. Never did we feel we were being persuaded to spend more or have things we did not need. The day of installation went like clockwork. The team had some tricky work to do including some plastering but they were efficient , did an excellent job and left the room as clean and tidy as possible. They gave us some useful tips and said to call if we needed anything. When we meant to settle up at Beckenham the friendly service and advice. continued. We would recommend Ward Antiques unconditionally. Thank you. We had a cast iron hood cleaned and a replica made. The clean brought out all the fine detail in the original. The replica was excellent and fits our second fireplace perfectly. George was very knowledgable and helpful. We would not hesitate to recommend. The Hither Green shop, which we visited, has some beautiful fireplaces and tiles, worth a visit on its own. We had lived for 30 years with two Edwardian original bedroom fireplaces both with disfiguring damage to the adjustable hoods. I finally got round to sorting them out and was delighted to find Wards. They made one good mould from the damaged hoods and then cast me two new ones. They are now fitted and look great, just as they did when the house was built in 1913. We are well pleased. Highly recommended – fair pricing, excellent quality, super installation – looks fantastic and transforms the property! Had been recommended and was delighted we decided to clean up our marble fireplace as part of our SW London house refurb. Thanks for all the work and advice. Marvellous! The fireplace is stunning. High quality materials, high quality fitter – highly recommended. I turned to wards after having the misfortune of purchasing a fireplace from a different company which arrived with a crack in it. Despite the fact I had not purchased from them they took their time to reply to my emails and advise me of what steps I should take next. Although I was unable too use wards for the repair purely due to how far away I live I certainly wish that I had been able to. When I telephoned and spoke to George he took a great deal of his time to help me and enlighten me on a few things with regards to the fireplace even though I was unable to use their services. It was nice to speak to someone who was so friendly and helpful and I would highly recommend Wards to anyone who was thinking of using their services. Many thanks guys !!!! !